Phoibos Apollon, and to house him in a lavish temple? and shall never produce vintage nor grow an abundance of plants. “Homeric Hymn to Apollo,” 51.60, in The Homeric Hymns, ed. and trans. Apostolos N. Athanassakis. A scrappy bit of rock set in the waters of the eastern Mediterranean, the island of Delos overcame its barren soil and its size (less than 2 square miles!) to become one of the most important cult sites in classical antiquity. It was sacred to Apollo, the legend goes, because it sheltered his mother, Leto, when she needed to give birth. When Leto became pregnant with Zeus’s twins, Zeus’s wife Hera cursed her to be turned away from all the lands of the world. Luckily for Leto, Delos was a floating island and didn’t count as “land,” so she was able to give birth to her twins, Apollo and Artemis, upon it. Later, according to the Aeneid, its wandering stopped when “blessed Apollo chained it to Gyaros and the steep coast of Mykonos, and gave it to stable cultivation, and to spurn the winds” (3.75-77, translation mine). As a religious site, Delos flourished, both independently and under the control of Athens, from the 5th to the 1st centuries BCE. In the first century BCE, however, the island’s fortunes turned. After a devastating raid during the First Mithradatic War in 88, followed by another blow by pirates in 69, Delos diminished to a shadow of its former glory. Although some inhabitants held on for a while, the island was deserted by the middle of the first millennium. The once-rich site lay abandoned for centuries. In the seventeenth century CE, European travelers found this abandonment very convenient. Paired with the prominence of Delos in Greek and Roman myths and poetry, this convenience helped kindle their interest in the site. Beginning in the early 1600s, as I have been seeing in my work, an increasing number of western Christian travelers started making a point to stop in ancient Greek lands as they went about their business in the eastern Mediterranean. These travelers liked to collect antiquities, whether coins, statues, or pieces of architecture, taking them back home as souvenirs. As David Noy put it, generally, “the main problem lay in removing antiquities in the teeth of opposition from Ottoman authorities and local Greek populations” (375). These obstacles, however, “did not exist on uninhabited Delos” (Ibid.). In the seventeenth century, therefore, Delos provided a particularly attractive opportunity for acquiring ancient Greek objects, so it drew a disproportionate number of travelers with antiquarian interests. Not everyone, however, could go to Delos. It was a long and expensive trip, beset with the risk of shipwreck or piracy. A market existed, however, to see Delos (and other Greek islands) from afar, which brings me to the images I wish to share with you. The title page of the French translation of Olfert Dapper’s Naukerige Beschryving der Eilanden in de Archipel, an encyclopedic treatment of many islands in the eastern Mediterranean. Aphrodite and Poseidon are in the foreground, while the figure on the right represents the Colossus of Rhodes. The figure on the left may represent Apollo, to whom Delos was sacred. 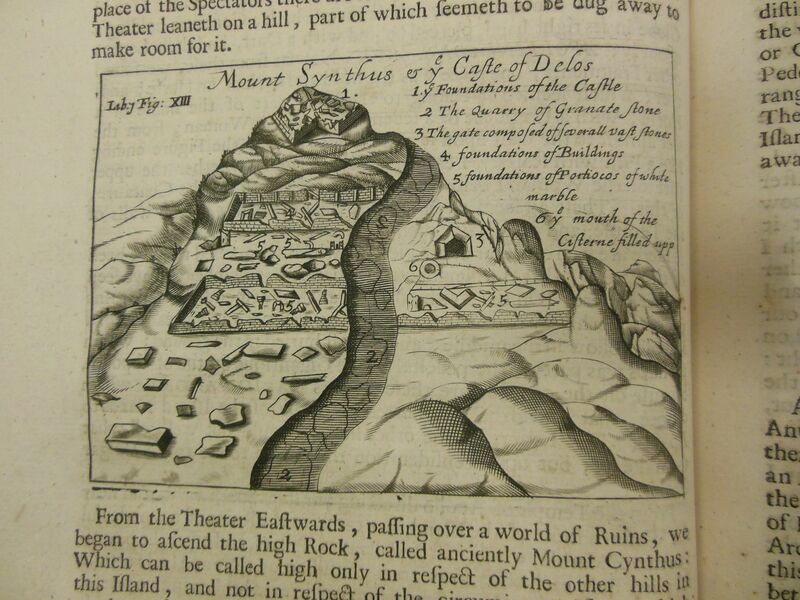 To help their readers imagine the far-flung locales through which they passed, early modern travel writers, like travel writers today, would usually include some illustrations. As the circulation of printed books expanded, it had never been easier for European readers to get a glimpse of life elsewhere. At the same time, these images were often fantastical or exaggerated, and to make things more difficult, we often don’t know where they come from. Sometimes artists traveled abroad, like Guillame-Joseph Grelot or Cornelis de Bruijn, whose accounts were illustrated with engravings based on drawings they themselves had made, or an author could hire an artist to journey with them. Even in these cases, the quality of images could vary, if the artist was in a hurry, or was poorly trained, or if he saw just what he wanted to see. In other cases, however, the artist behind a travelogue’s engravings was himself an armchair artist, relying on some combination of imagination, text, and previously published images, which he might just copy. If the artist did copy an earlier image, it wasn’t common to attribute it, so we often can’t tell an image’s original source. Olfert Dapper’s voluminous Naukeurige Beschryving der Eilanden in de Archipel der Middelantsche Zee, a 1688 Dutch encylcopedia of the Mediterranean islands, was among those books whose information and illustrations were both compiled from secondary sources. Dapper (1636-1689) was born in Amsterdam and never traveled farther from it than Utrecht. 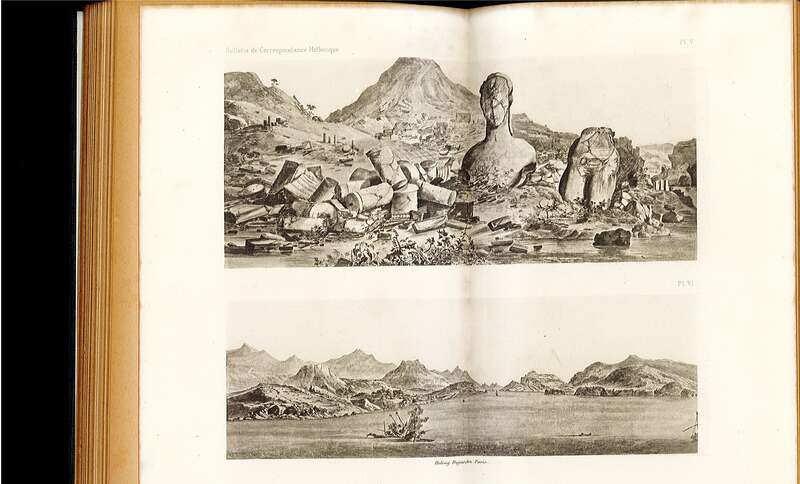 C. Decker, the engraver whose name appears on Dapper’s two images of Delos, also seems unlikely to have visited the Greek islands. It was an expensive trip! So where did Decker get his images of Delos? 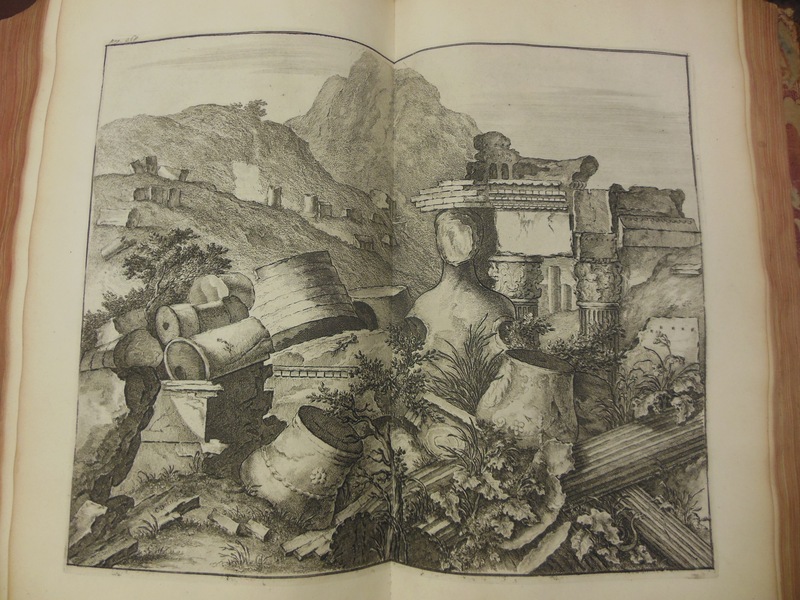 Nobody has studied where Dapper got his images from in this volume, but the sources of Decker’s two engravings of Delos, at least, are clear. An 1893 article revealed the source of Dapper’s second illustration of the island, while last week, I discovered the source of the first. 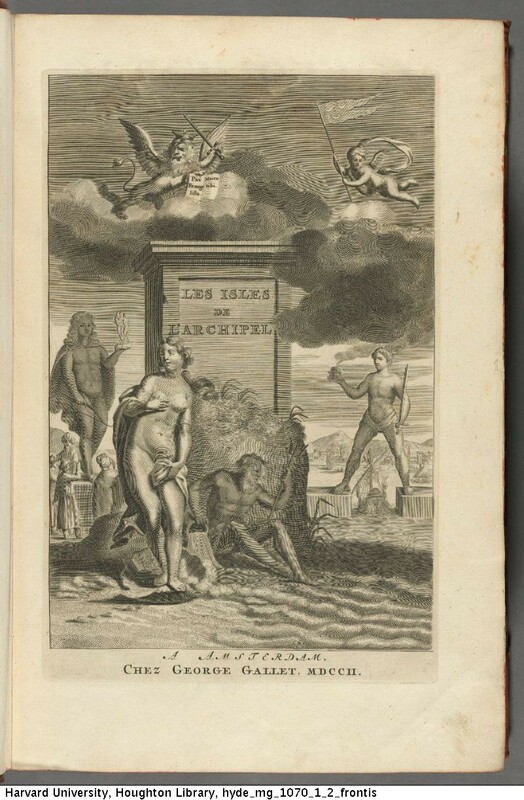 The statue of Apollo on Delos, at p. 368 of the translation of Dapper’s work into French. Corresponds with the engraving at p. 174 in the Dutch original. (The Dutch pagination restarts several times.) See Decker’s name in one of the stones on the bottom left. Reinach, 652, Plates V and VI. The upper plate is the image in question. Without a precise date for this engraving, it could have been taken from Decker’s work, or Decker could have copied it. Although both of images exaggerate the height of Mt. Kynthos (see Deb’s photo for comparison), Reinach believed that Decker’s had more “fantastical details,” like “the kind of out-of-place contruction [on the right],” and that the anonymous engraving was therefore Decker’s source (139-140). I am inclined to agree with Reinach, although it could go either way. Dapper’s Kynthos, p. 372 of the French edition and p. 167 of the original Dutch. As I was turning the pages of Dapper’s book and came upon this image, I stopped, because I knew that I had seen it before. 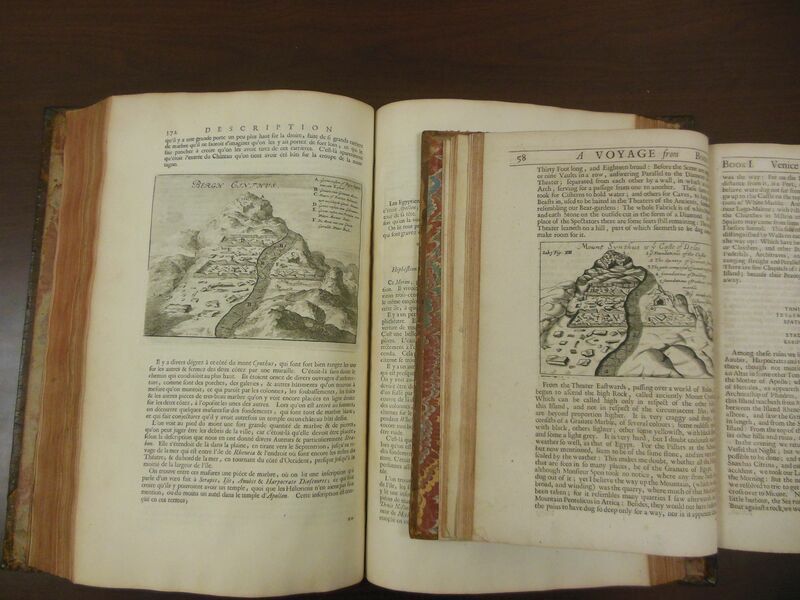 It came from Wheler’s A Journey into Greece, I thought, which had come out in 1682. After looking up the page number in my earlier notes, I was able to turn to Wheler’s rendering of Mt. Kynthos, which follows. George Wheler and Jacob Spon traveled together in the eastern Mediterranean in the mid 1670s, and Wheler published his account of the journey in 1682. 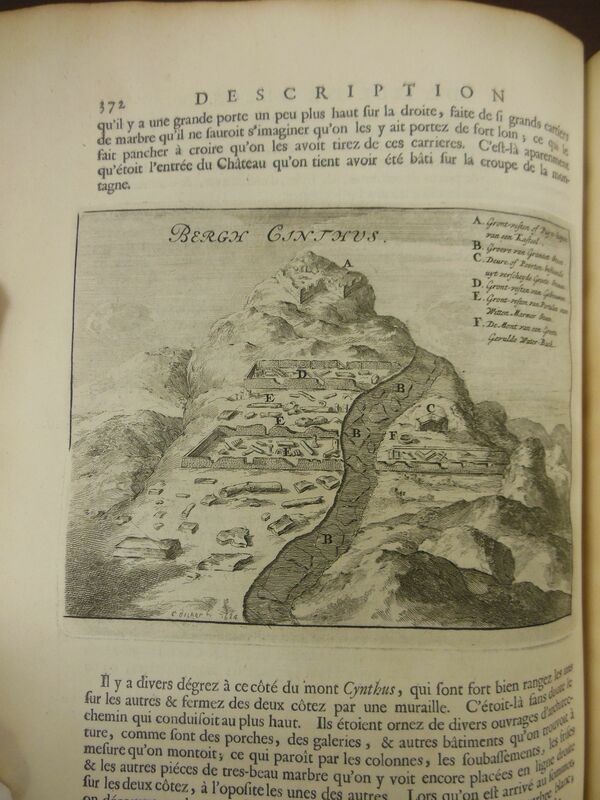 (Spon published a travelogue in 1676, but it did not share this image). Decker’s engraving is dated from 1684, as you can see on the bottom left, so it was based on an image published just two years earlier! While Dapper may not have traveled himself, this image shows that his work draws on the latest contemporary sources. We don’t know what all of Dapper’s sources were, but we now know one more than we did last week. Bruneau, Philippe, and Jean Ducat. Guide de Délos. Third edition. Paris: École Française d’Athènes, 1983. The Homeric Hymns. Edited and translated by Apostolos N. Athanassakis. Baltimore: Johns Hopkins University Press, 2004. Noy, David. 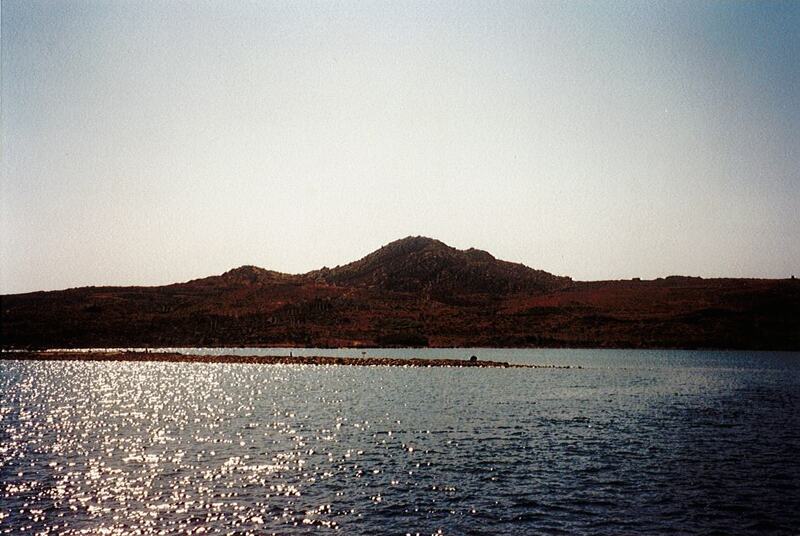 “Dreams inspired by Phoebus: Western visitors to Delos from the seventeenth to the nineteenth century.” International Journal of the Classical Tradition 18, no. 3 (2011): 372-392. Reinach, Salomon. “Le colosse d’Apollon à Délos.” Bulletin de correspondance hellénique 17 (1893): 129-144. Vergil. Bucolics, Aeneid, and Georgics of Vergil. Edited by J. B. Greenough. Boston: Ginn & Co. 1900. Wills, Jr., John E. “Author, Publisher, Patron, World: A Case Study of Old Books and Global Consciousness.” Journal of Early Modern History 13, no. 5 (2009): 375-433. Nice bit of sleuthing! Wonderful blog post! What a great post! May I reblog this one? It is timely for me in that I have been posting about Aegean settings in Shakespesre’s “Pericles” and your post fits nicely in my progression. It gives another reason why an Englishman of the 17th Century may have found himself in the Aegean.